We apologize for the delay in posts, spotty internet and scheduling seemed to get in the way. Upon leaving Santiago we chose to continue down the coast into Portugal, We were enjoying Spain and were sad to leave, but decided we would return to Spain via Seville later in the month. As we entered into this country of kind and welcoming people, we were greeted by colorful houses that were somehow even more beautiful with laundry hanging from their upper windows, red tiled roofs (sometimes these had fallen in), tall winding hills doted with churches, and of course shimmering blue water, as Porto is located where the Douro River converges into the Atlantic Ocean. 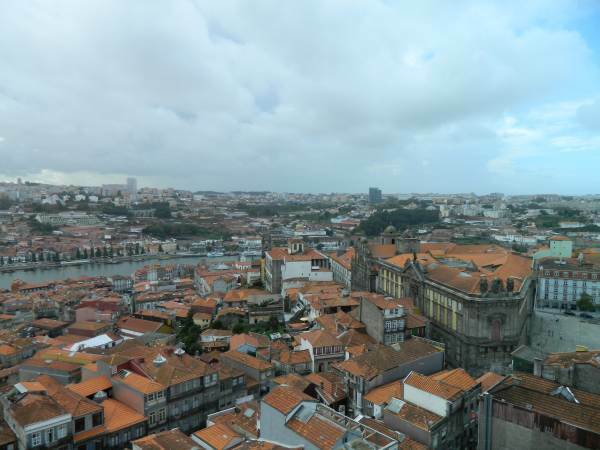 Porto, Steve’s favorite town thus far, is a charming place to walk and enjoy narrow cobblestoned (impossible to walk on in heels) roads, visit breathtakingly beautiful churches, learn about Fado music and taste port wine. 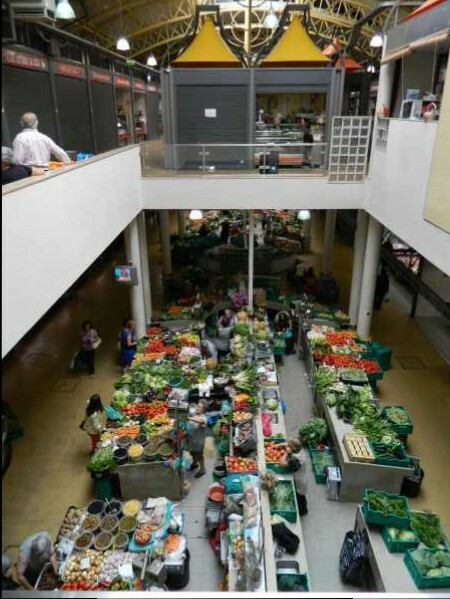 Its easy to notice the change in architecture and style as we move across Europe. 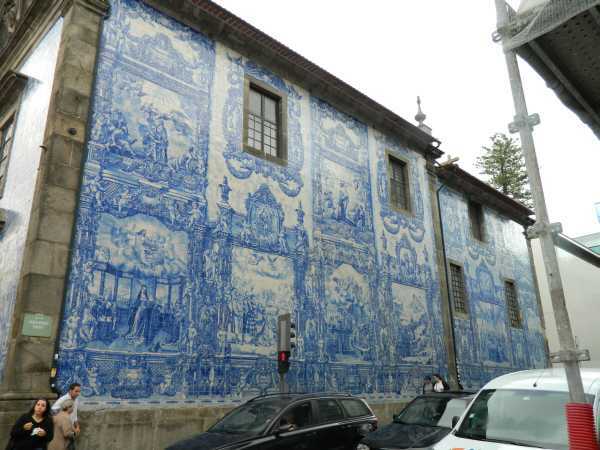 There is no doubt that Portugal is the place to find tile or as the natives call it “azulejo”. Tile covering the side of this government building. View after climbing the 252 steps to the top of the Clerigo Tower. 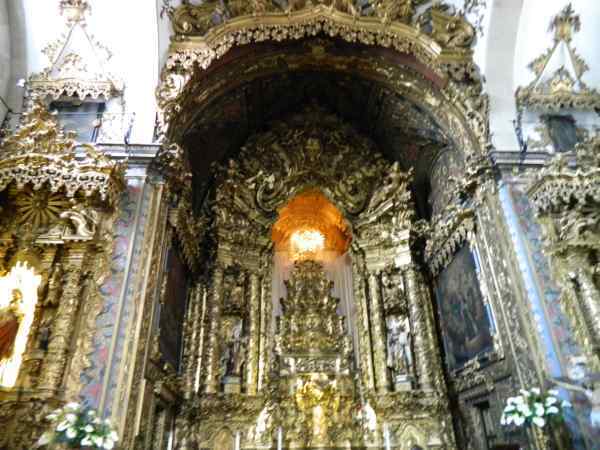 The Gothic architecture of Sao Francis Church with a Baroque interior and lavish use of gold filigree. 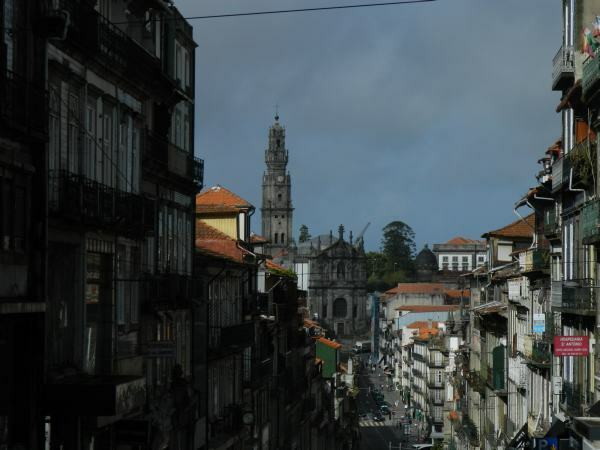 Steve loved Porto and feels an affinity toward the wonderful people of Portugal. It’s not because he is half Portuguese, but instead it’s because the Portuguese people we have had the pleasure of meeting are animated friendly and loud, just like him. 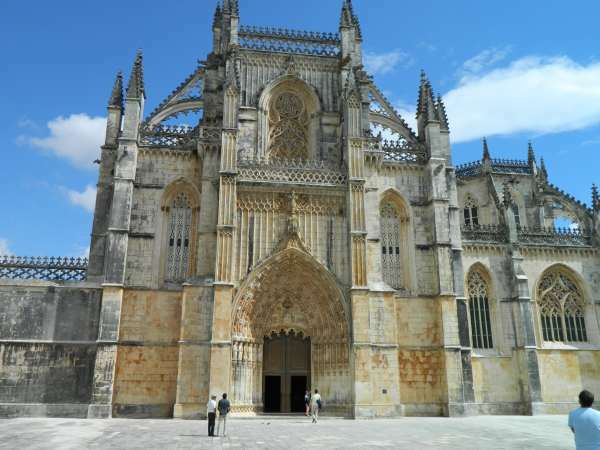 Coimbra is home to Portugal’s oldest and most prestigious university. 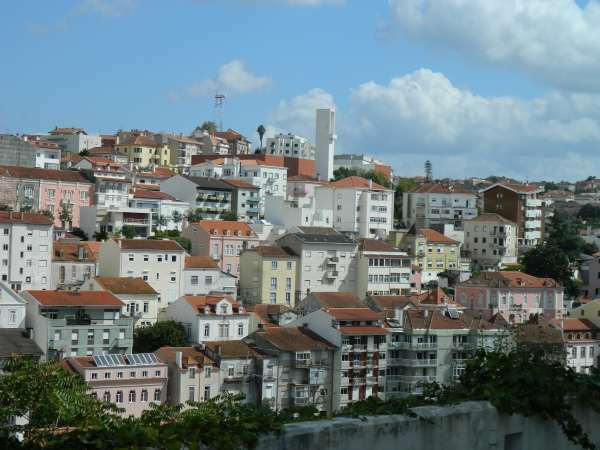 We wanted to visit and we were advised to take the funicular/elevator that would lift us up the long, steep hill to the university grounds. We were insulted to have someone think we were too old and decrepit to walk to the college, so we started up the very narrow, very roughly cobbled streets. We should have listened. :). It was fun walking through the expressive student housing, and seeing how students are students anywhere. 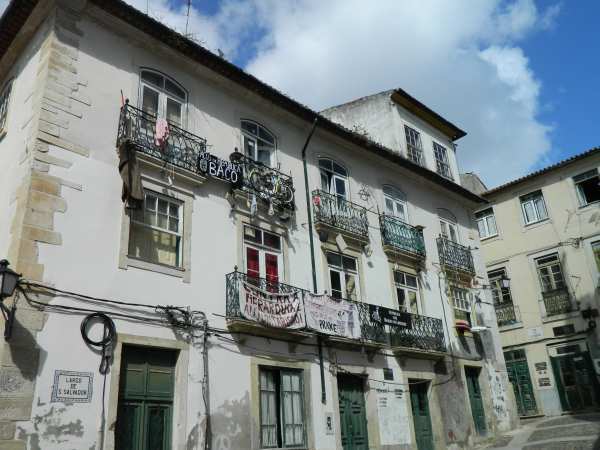 Coimbra University student housing. Notice the bicycle storage from the balcony. 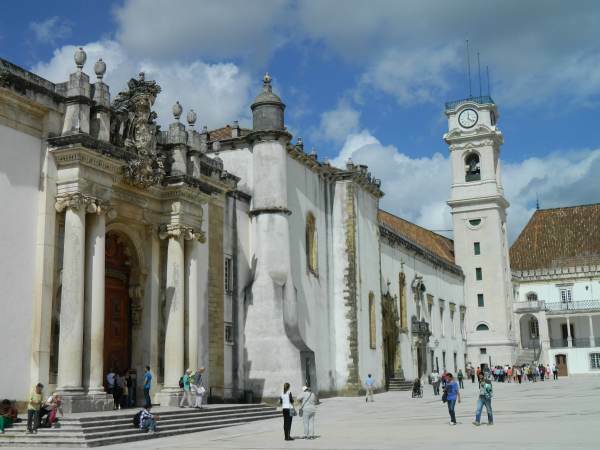 The university was founded in the year 1290 and is housed in a former royal palace overlooking the city. We spoke with a few students wearing their traditional uniform of a black cape. They were very well versed and each spoke English fluently. View from the college. We started our walk at the bottom of the hill. 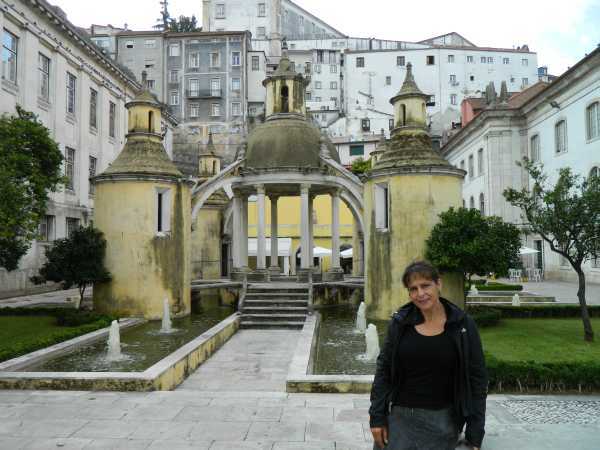 Historical architecture found throughout the city of Coimbra. 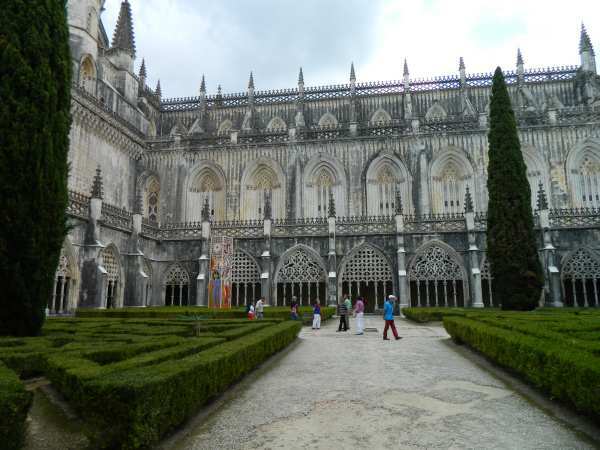 We stopped to visit this fancy late-Gothic monastery on our way to Fatima. The elaborate exterior did not prepare us for the planned simplicity and lack of ornamentation inside. The interior was dramatic in its simplicity and high arched ceilings. 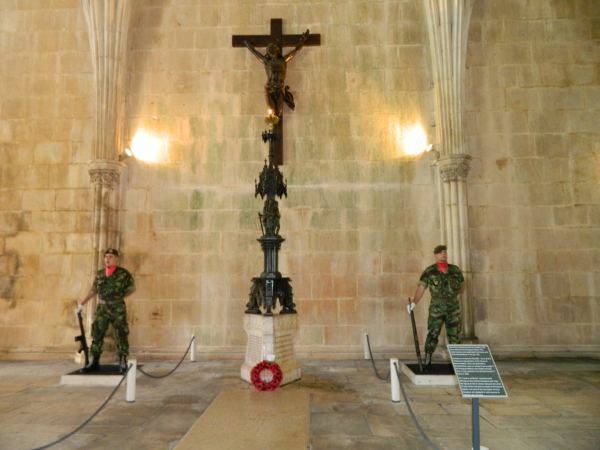 Portugal’s Tomb of Unknown Soldier resides here under the Christ of the Trenches crucifix, housed within the cathedral. Soldiers actually carried this very cross into battle in World War I. After the battle, French solders found the crucifix among the rubble and returned it to Portugal. It now stands as a memorial for Portuguese veterans of war. 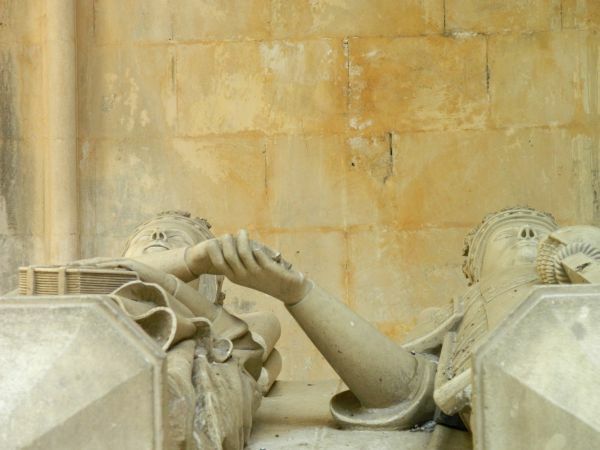 The double tomb (sarcophagus) of King John I and Queen Phillippa holding hands in the center of founders chapel was impressive. The tomb of their son, Henry the Navigator is also in the chapel. 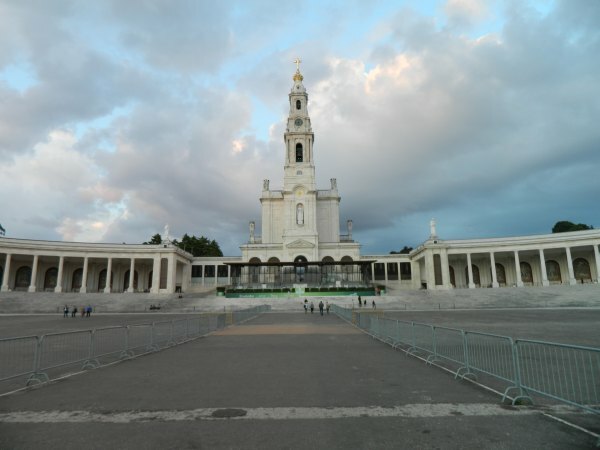 Fatima– It is said that Portugal is proud of their three “F’s”, Fatima, Fado, and Football (soccer to us Americans). After setting up camp (there was free camping for visitors), we decided to walk around, even though it was getting late. We noticed a mass going on outside (in Portuguese) and checked to see if an English mass was available. There was one! Only one, and it was to be at 5:30 the next morning. 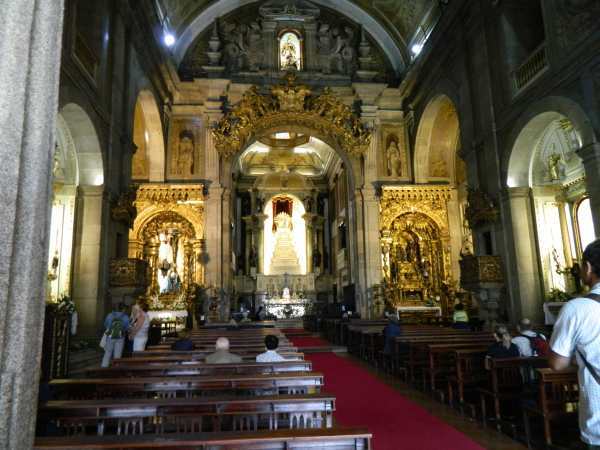 We decided we’d attend, We entered the Basilica that houses the tombs of the three children . We then walked outside and sat by the tree where the apparitions occured. As it was almost midnight, we returned to Dakota, we set our alarm for 4:00 a.m. and went to bed. As soon as the alarm went off the next morning, we jumped out of bed, rushed to the showers, being quiet as to not wake anyone else. After dressing carefully, we headed off to mass. When we arrived, there was no one else there! Steve then remembered that in Portugal the time was one hour earlier than Spain, and he had not reset his clock. We trudged back to camp (where I made coffee and then managed to spill the boing hot liquid down my leg and into my shoe). We did make it to mass at 5:00 a.m. smelling like coffee, even though we had not had any to drink. After mass, we headed to the visitors center (yes, it was open at 6:00a.m. ).The very kind and helpful woman told us about additional sights nearby including the houses of the children. It was a humbling experience. Returning to town we stopped at a few souvenir shops (there were hundreds), headed back to the bus for lunch and a nap. 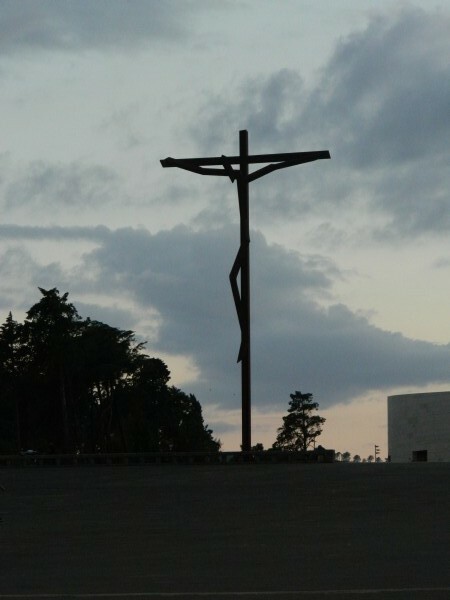 Huge modern crucifix over 100 feet high and 50 feet wide. This entirely walled city was a wonder to behold. 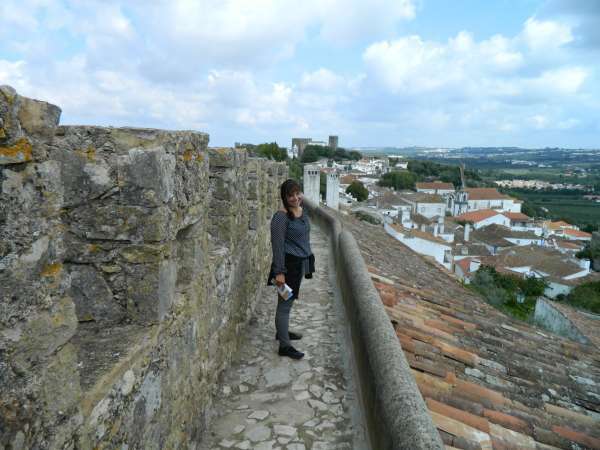 We climbed up and entered through its main gate and wondered at the narrow cobbled lanes. We then climbed the 14th century steep, uneven steps to the 45 foot high sentry path. 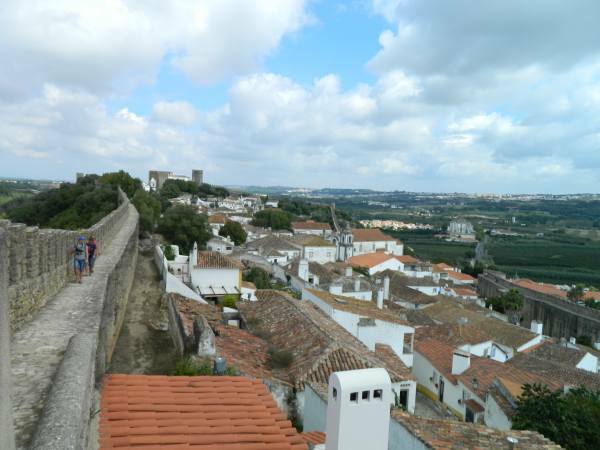 We followed the sometimes treacherous wall above and around the city enjoying the views below of the red roofed, white washed dwellings with their traditional blue and bright yellow trim. 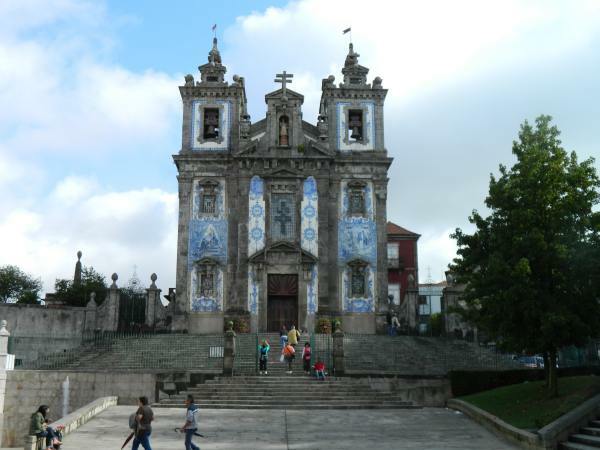 We walked the cobbled narrow lanes, had our first taste of ginjinha, Portugal’s famous cherry liquor served in an edible chocolate cup, and enjoyed the history- filled town (founded by the Celt’s in 300 B.C., then ruled by the Romans, then the Moors). Watch your step, its a long way down. If it were the middle of summer, this quaint little town would be overwhelmed with tourists. As it is October, we had it mostly to ourselves. 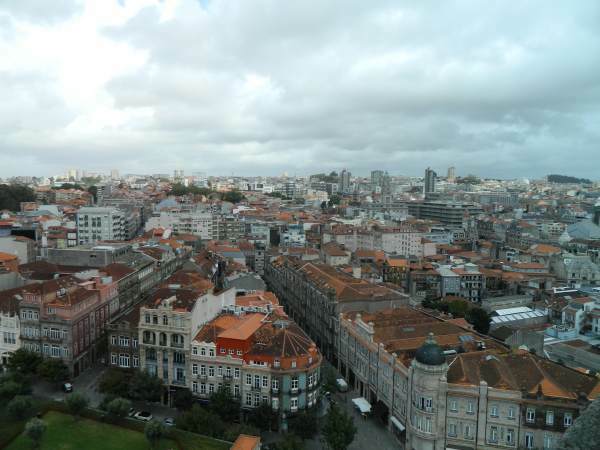 As we walked downtown, elderly ladies would ask us, in Portuguese, if we wanted to rent one of the rooms in their homes. At first we did not understand, but then we saw the piece of cardboard in their hands that read “quartos, room?” It was touching and charming. Everyone we met was kind and helpful. 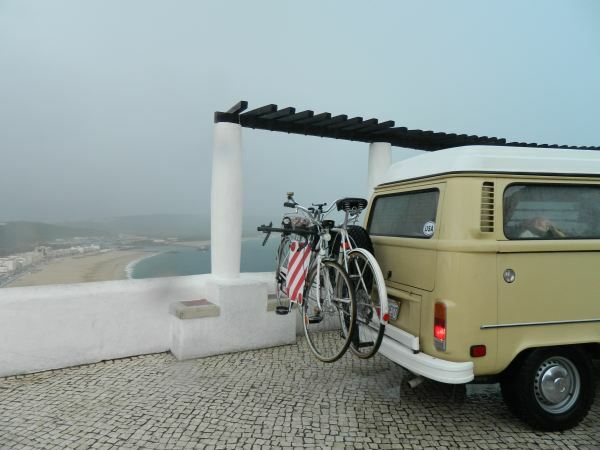 The atmosphere was relaxed, the views of colorful laundry hanging from the colorful buildings, the salted fish hanging out to dry, the beautiful coastal views, and the drizzling evening rains were all magical in this wonderful town. 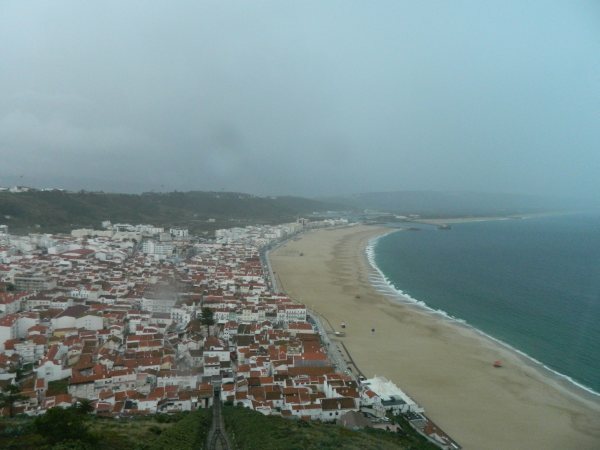 View of Nazare and the beach taken from the old part of town on the hill. 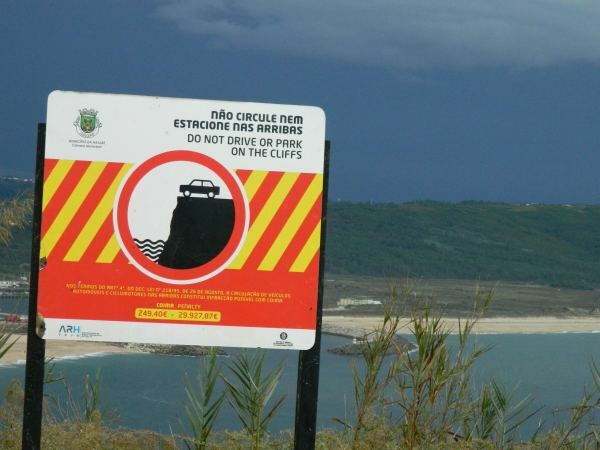 You can drive right to the edge. It rained for five days straight! Just another day in paradise. 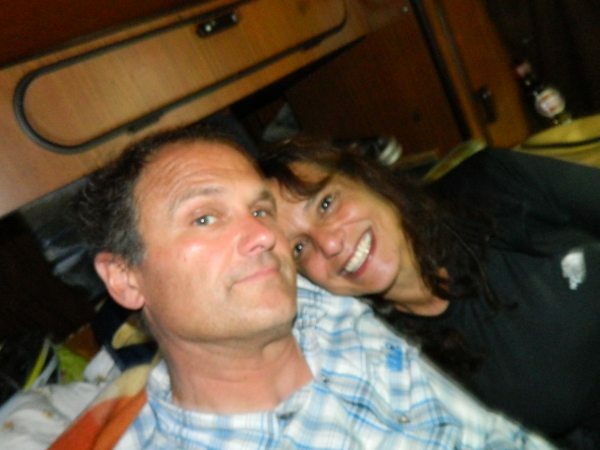 Wonderful to see your journey and the great pics and superb writings! Wonderful, charming and inspirational!!! Thanks for sharing!